The fair price is not final since this is only a draft, which need your feedback. Kerala might be the first state to do this in India. 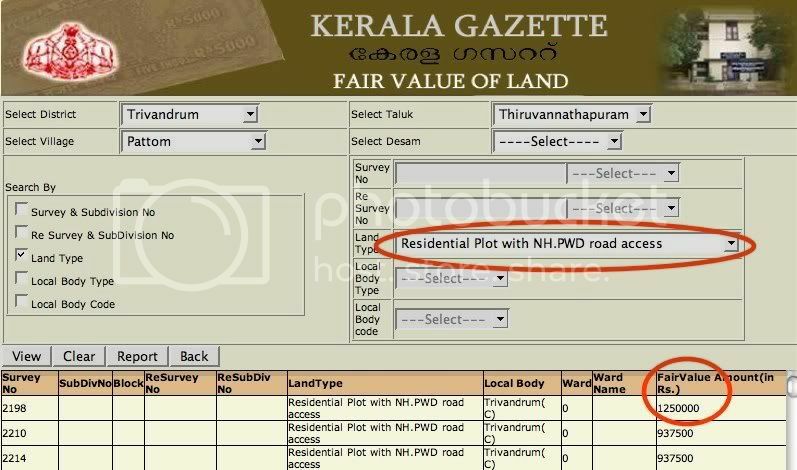 The land types in Kerala according to the database are. To curb stamp duty evasion during land sales in Kerala, Kerala Government on 5th May 2008 notified draft of 'fair prices' for lands in Kerala. Two months would be given for the public to give their views and the final notification would be issued by July 05, 2008. The draft copy which was available in all village offices is online now. "The stamp duty also would come down after fixation of fair prices for lands. It would also put an end to the practice of showing 'lower price' for land during registration." The fair value of each district in Kerala - Trivandrum , Kollam,Pathanmthita ,Alleppey, Kottayam, Idukki, Ernakulam , Trichur , Palakkad, Malappuram ,Kozhikode , Wayanad,Kannur ,Kasargod can be checked.